Clear Flat Polypropylene Bags with Lip n Tape Closure, 9" x 12"
Clear Flat Polypropylene Bags with Lip n Tape Closure, 6" x 9-1/2"
Clear Flat Polypropylene Bags with Lip n Tape Closure, 4-1/2" x 5-1/2"
Clear Flat Polypropylene Bags with Lip n Tape Closure, 5-1/4" x 7-1/4"
Clear Flat Polypropylene Bags with Lip n Tape Closure, 4-1/8" x 9-1/2"
Clear Flat Polypropylene Bags with Lip n Tape Closure are an easyway of closing your bags great for selling smaller items like bake sale goodies, small artisan treats, or tiny parts for craft items. We have labels that would make for a very attractive finishing touch. Plus, the bags are Made in the USA and are recycled! 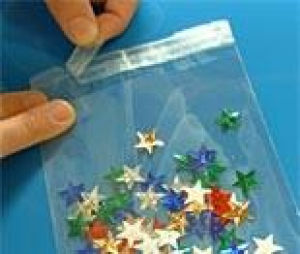 These bags are made from 100% recycled material, and are FDA approved for food contact. Packaged 100 per case.